The Scotshaunbuik library (leebrarie in Scots) will eventually be a list of useful links, books and academic articles on Scots. Here are a few to get started. 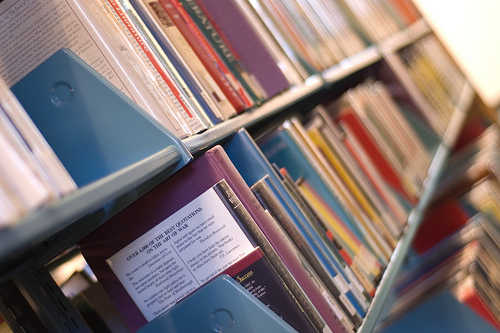 Wir Ain Leed – an excellent and detailed introduction to written non-regional Traditional Scots. William Grant and James Main Dixon (1921) Manual of Modern Scots. A superb attempt to describe a standard ‘literary’ Scots based on contemporary East Central speech and (mainly) 19th Century literature. The wide range of sources include ‘Kailyard’ writers (eg Barrie, Crockett, Maclaren), Bell (see below), Burns, Scott and Stevenson as well as local papers and ‘reminiscences’. Available as a reprint from Amazon.co.uk or online. Wilson, James (1915) Lowland Scotch Meticulous investigation of the speech of the Perthshire village of Dunning (where I used to live! ): pronunciation, grammar, wordlists, sayings, idioms, expressions. Legend has it this was the book that inspired Hugh MacDiarmid to start screivin awa in Scots, and I’m not surprised. Available as a reprint from Amazon.co.uk or online. Alexander Bergs (2005) Modern Scots 2nd edition (2005) excellent grammar by a German linguist. Draws together a wide range of 20th century research on the modern tongue to provide the best detailed descriptive grammar of current usage. The The Aiberden Univairsitie’s Scots Leid Quorum’s Innin Ti the Scots Leid (1995) is a useful 44 page booklet and where I started with the grammar of Scots. Strong on spelling and of course grammar with some useful vocabulary lists. David Purves (2002) A Scots Grammar (Revised Edition) published by the Saltire Society, Edinburgh is as close as we have to an ‘official’ grammar for standard Scots. Lots of examples. Susan Rennie and others (1999) Grammar Broonie published by Polygon, Edinburgh is aimed at children (and their teachers) and is a basic introduction, with exercises. Philip Robinson (1997) Ulster-Scots: A Grammar of the Traditional Written and Spoken Language, published by The Ullans Press, Belfast. Outstanding scholarship; a re-writing Grant and Dixon for the Ulster dialect. 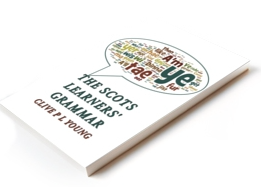 L Colin Wilson (2002) Luath Scots Language Learner published by Luath Press, Edinburgh, the first Scots language course for the complete novice, has excellent sections on grammar. 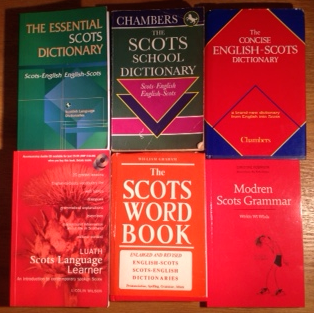 The Concise English-Scots Dictionary (1993) and its companion Essential Scots Dictionary (1996) from The Scottish National Dictionary Association and published by Chambers, Edinburgh are the best prescriptive dictionaries available and were used to attempt a standardised spelling for this grammar. Christine Robinson (2012) Modren Scots Grammar: Wirkin Wi Wirds, aimed at children.